So far I've always stuck to a slightly modified version of Jiquera Mondilano's data changer, with the starting popup removed and adding a now outdated link into the unused space at the beginning of every saved .dat file. I've been yearning for something better to work with for a long time. Everything else available has however failed me with its key features/improvements (being inconsistent or crashing). I hope to be doing better on that front, while also aiming for a truly improved work flow instead of feature bloat. The key feature for now is the frame viewer, which you can toggle in the view menu or with alt+V. It will display the currently selected frame with all its elements. You can zoom inside it with the mouse wheel, pan around by dragging while holding space, adjust all frame elements via click and drag and even the frame center by dragging while holding ctrl (+shift to lock vertical/horizontal axis). Once I have added more editing capabilities it will probably be renamed 'frame editor' and ultimately 'visual editor'. The text editor itself uses the Fast Colored TextBox by PavelTorgashov. If you have a good reason for me to (visibly) implement any of its features I haven't included yet, let me know. A smaller update. 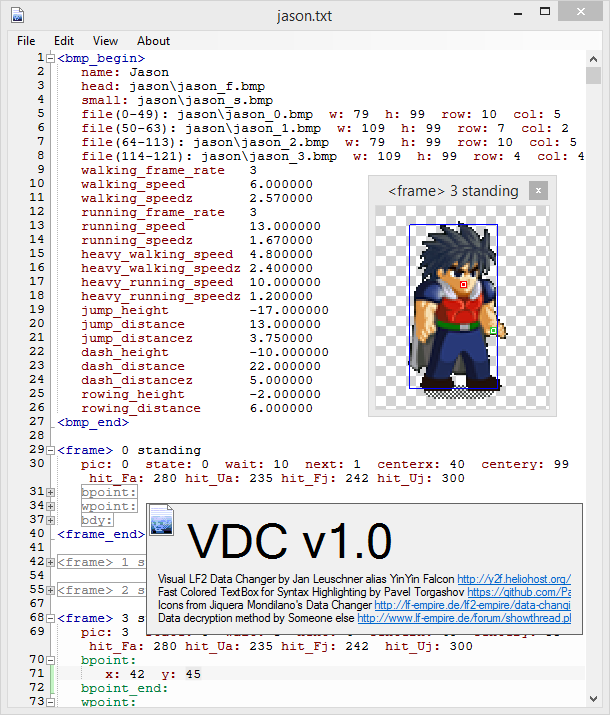 Mostly allowing you to still edit frame data visually even if there is no picture found. Also working without an lf2.exe to locate bitmaps. And auto indenting and formatting has been improved to better work with single line tags and you can also turn it off in the settings. Full .dat support! Including a crude settings dialogue allowing you to change the font and the 123 characters preceding your saved .dat files. Also custom notifications in case your bitmaps don't show up in the frame viewer and triple undo/redo to skip the line delete/insert steps. Fixed a few possible crashes and weird behaviours. Most notably the frame viewer has expanded controls. 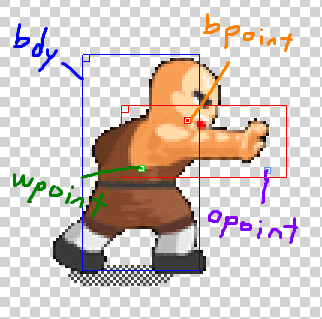 You can now directly drag around all w/b/o/cpoints within the frame viewer and navigate frames with up and down arrows. See the spoiler for general/previously implemented features. While the program can import .dat files with the method Someone else fixed for me, it will for now only save .txt files to prevent you from damaging any original data (LF2 can load .txt files). I may add .dat saving as an option in the future, if I feel enough people have managed to use this without problems. 1. Edit -> Settings -> uncheck "auto indent everything" if you don't like how it automatically reformats your text. 2. Alt+V to view the frame. 3. Select the viewer. Hold [SPACE] & drag to shift your perspective. 5. [Mouse Wheel] to zoom in/out. This is a godsend! Now I don't have to be super precisely measure individual pixels anymore! 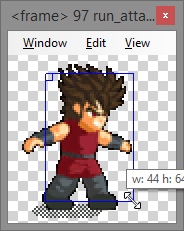 1) Can't see a grid to box up the individual sprite, which would make coordinate-finding even easier since I no longer need to refer to the sprite file itself to know where the top left corner is. 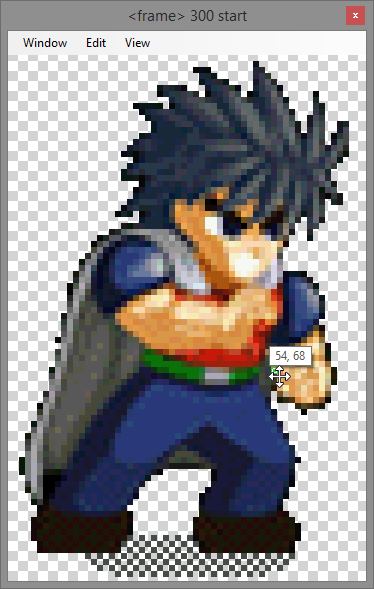 2) Can zoom in on the picture, but it always zoom towards a specific point and I cannot drag around the sprite. I have to alter the window size instead. 3) Minor point: would be nice if you can activate another grid for individual pixels. #2: This is zoomed in. 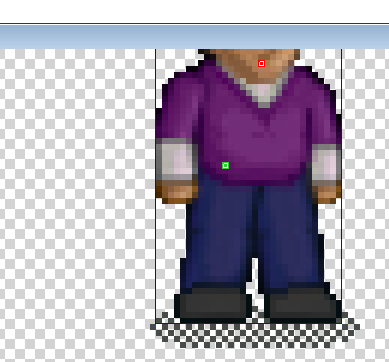 I want to be able to see the head too, but I can't drag the image down or use arrow keys to see the head. Did I miss anything? (04-02-2015, 04:19 PM)YinYin Wrote: While the program can import .dat files with the method Someone else fixed for me, it will for now only save .txt files to prevent you from damaging any original data (LF2 can load .txt files). I may add .dat saving as an option in the future, if I feel enough people have managed to use this without problems. This is pointless. Doesn't this mean I will have to change the names of my .dat files in data.txt to end with .txt instead? While it might be good to have a backup, it would only work the first time you save it, and then you'd have to open your newdat.txt and the backup "feature" is gone. It also means that I can't assign the program as my default editor for my new data files since they're .txt now, and I do want to have a datachanger open my .txts for me. 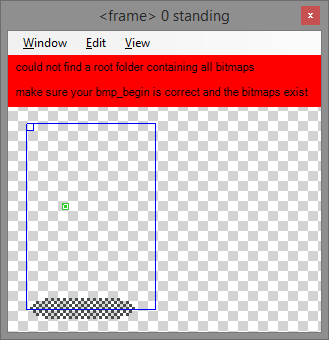 (04-02-2015, 04:32 PM)STM1993 Wrote: 1) Can't see a grid to box up the individual sprite, which would make coordinate-finding even easier since I no longer need to refer to the sprite file itself to know where the top left corner is. I can see how this would be useful right now. Once you can drag around every element within the visual window I see little point to seeing a pixel grid though. I'll give it some more thought, but other things have priority. (04-02-2015, 04:32 PM)STM1993 Wrote: 2) Can zoom in on the picture, but it always zoom towards a specific point and I cannot drag around the sprite. I have to alter the window size instead. Hold space and click+drag to pan around. Yes, but it's not pointless. The editor can natively import/open .dat files. The point is you cannot save over .dat files so you cannot damage them. Everything you work with in .txt format and this editor is obviously in danger of being scrambled by whatever naive programming mistakes I made (happened to me once on another editor - never using new tools without backups again). I know directly assigning this is useful, and you can assign this editor to .dat files. For .txt files just drag them onto the program to quickly access them for now. I want enough people to properly test this before diving 100% into using it all the time. Other than that the encryption also seems pointless to me and I'd love to fly without whenever I can. A unique file type is another thing, sadly LF2 seems to only load either .txt or .dat. In short: please try to crash it, break it, make it fail at any task you can think of throwing at it. And report back with detail. couldnt you make the txt documents just use a different file ending? How do u guys open Pics By this Dc engine. I Have tried But couldn't open the images. (04-02-2015, 11:33 PM)Bamboori Wrote: couldnt you make the txt documents just use a different file ending? You can do that. Assign the program to a custom filetype of your choice and open/save these like any other txt file. Vanilla LF2 won't be able to load them though. (04-08-2015, 01:03 PM)DARK-EVIL Wrote: How do u guys open Pics By this Dc engine. This program is not made for opening images. 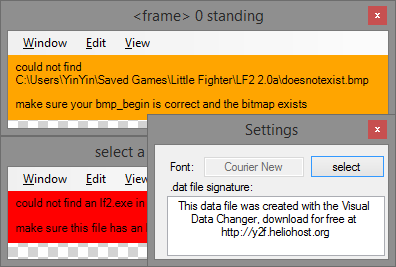 It will instead retrieve the bitmaps noted in the <bmp_begin> of a data file if everything is in the same or sub folder of an lf2.exe to display them inside the frame viewer (Alt+V). So can u tell me what this Viewing bmp pic Can hel me While DChanging A Character. Its re-directing me to the same page again and again after clicking Authorize Download. Current time: 04-24-2019, 07:36 AM Powered By MyBB, © 2002-2019 MyBB Group. Theme created by Silverthorn.